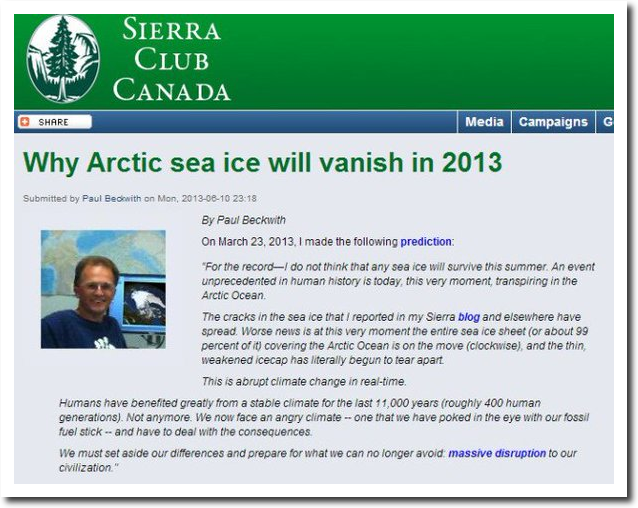 Five years ago, University of Ottawa professor Paul Beckwith explained why the Arctic will be ice-free in 2013. Now he has granted the Arctic a ten year reprieve, and says the Arctic will be ice-free in summer five years from now, and will be ice-free year round shortly thereafter. There has been no trend in Arctic sea ice extent over the last twelve years. But climate scientists aren’t interested in facts. 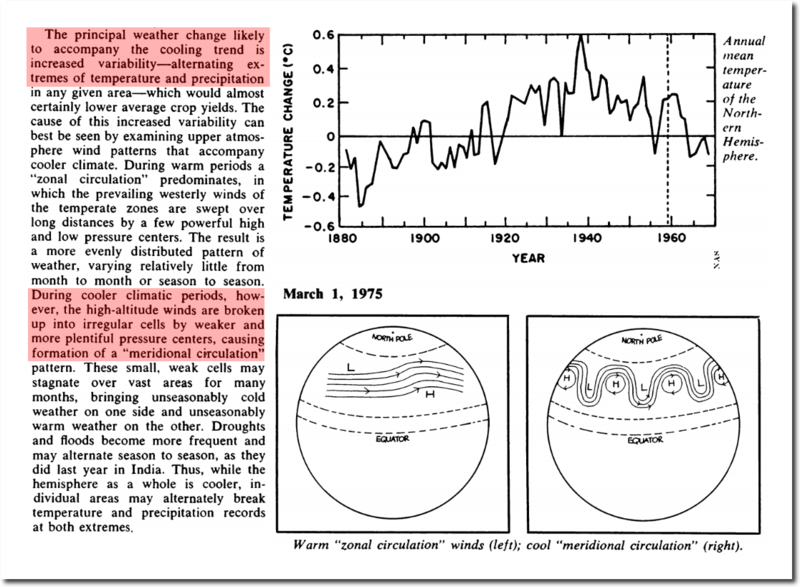 In his video, Beckwith also blamed meridional circulation and stalled weather patterns on global warming. 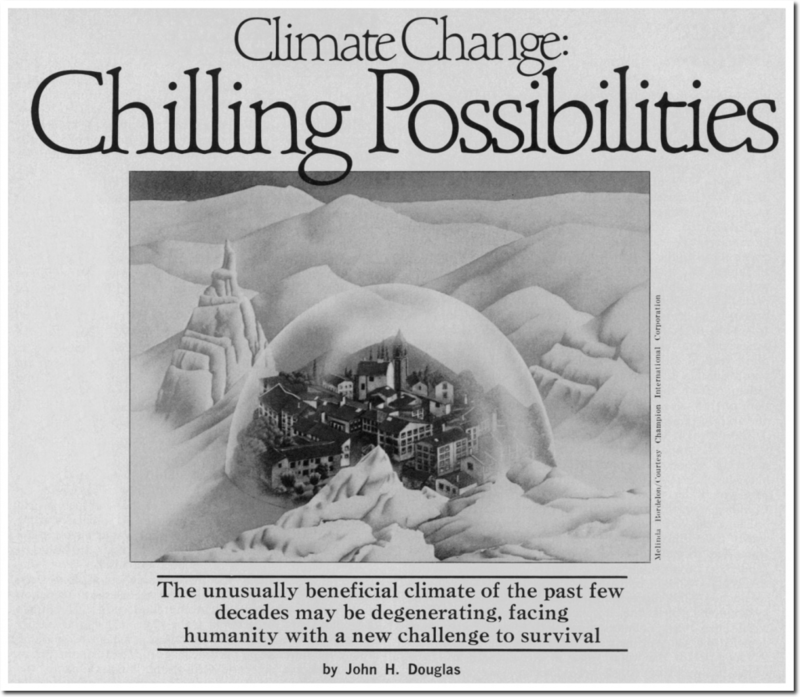 In 1975, climate scientists blamed the exact same things on global cooling. They apparently are unable to distinguish between cooling and warming. With Hurricane Florence forecast to stall over the Carolinas, climate scientists snake oil salesmen will (of course) be parroting the same gibberish about a global warming caused wavy jet stream and polar vortex. The exact opposite of what they said in 1974. This clown show goes on day after day, with the Democratic Party adopting it as their official religion. Meridional is due to low solar activity. We’re into solar cycle minimum conditions and we’re again getting blocking events like we did back in 2010. I’m mystified how CO2 can affect the Sun. No, it is the rooster. 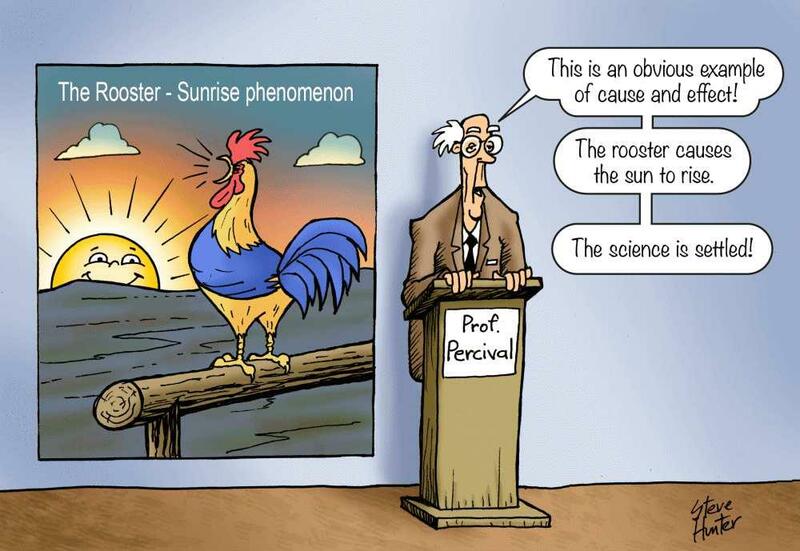 No, it is the rooster (sorry forgot the cartoon). Last line is V. good. This Sierra clown doesn’t care about the arctic or any other environment because he is lining his pocket with at 6 figure salary. He’s a low-level idiot who went way out on a limb while working on his degree at an advanced age five years ago. Look around him. His prestigious office is in the basement lobby. Just down the hall from to the janitor closet. This twit deserves incredulous laughter. 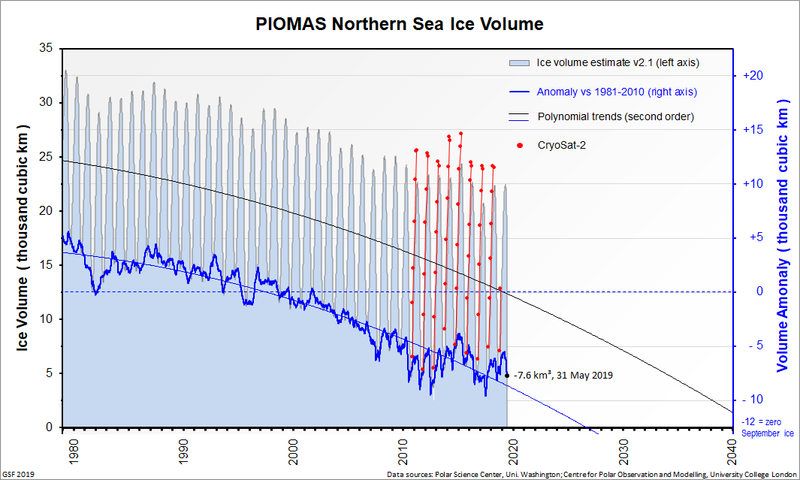 What amazes me is that so many of these moronic these turds really believe that cracks in a floating polar ice cap is unusual – and from which they think they can extrapolate its future demise. And with such precision. ‘Professor’ Beckwith has his head shoved so far up his arse he has no idea how badly he is embarrassing himself. Again. Only then will I take him seriously. Which unit of measure contains the largest volume of Arctic ice? One Wadhams of zero ice, one Beckwith of zero ice or one Maslowski of zero ice? The media is ready to go full bonkers about a CAT 4 hitting the Carolinas, just like Hugo did in 1989 or Helene in 1958, or Hazel did in 1954, or like one in 1944, or like when 2 did in 1893. But nevertheless, Florence is unprecedented and it’s all Trump’s fault! There has been a “stable climate for the past 11,000 years”? That comment alone should permanently discredit this supposed “professor”. A classic sign of a cult when they move the goal posts ahead to maintain their delusion. It is currently IMPOSSIBLE for it to free of ice in the winter, it is well below freezing for months, with NO sunshine in most of the region. He is a snake oil salesman, who is an idiot. I love the inflatable globe. Oh, and every direction from the north pole is south. Give Beckwith a a break. He is obviously intoxicated. The guy needs AA. Sad. His initial claim came after the unusual Arctic 2012 melt and I wonder if that clouded his judgement on his call for 2013? It was known at the time that the storm of summer 2012 broke up the ice and allowed more melt, so this was a weather event and far too low. I just had the misfortune of watching that guy come up with a defense as to why Greenland has amassed 1 trillion tonnes of snow/ice. These guys are nuts!! Climate Change Bond Villain: ‘We don’t like the fact that Greenland has increased its ice mass and we are worried that we are long overdue an extreme event that adds triple the amount lost in 2012 so, let’s get together and come up with a lot of waffle in an attempt to give us another couple of decades grace, ideas?’. Paul Beckwithout: ‘OK, No problem! What about making Greenland the new North Pole? I’ll do a video about it, repeat it over and over to plant the idea and we can refer to it in all upcoming papers! We will preempt the event and claim it as a direct result of Man Made Climate BS. I’ll throw a few staples like, drought, floods, heatwaves, extremes, inability to grow crops. Hysteria will kick in whenever Greenland adds to it’s Ice Budget and we can rest for at least the next 20 years cooling cycle?’. Seriously! why do people buy in to this shiite? He is talking of ‘serious climate science’ with a frickin beach ball!! Knob!!! Love these delusional predictions. Should post this to every Arctic scam article on Twitter. Further to my comment on John Maddox, ex science editor of the Guardian becoming editor of Nature (on the ministry of truth post), here we see the Assistant Editor of Nature, John Gribbin, publishing articles in the Guardian (1974 Guardian article above). As if we needed telling that there is a link between leftist media and science journals, and it has been going on for 55 years (Maddox article in 1963). 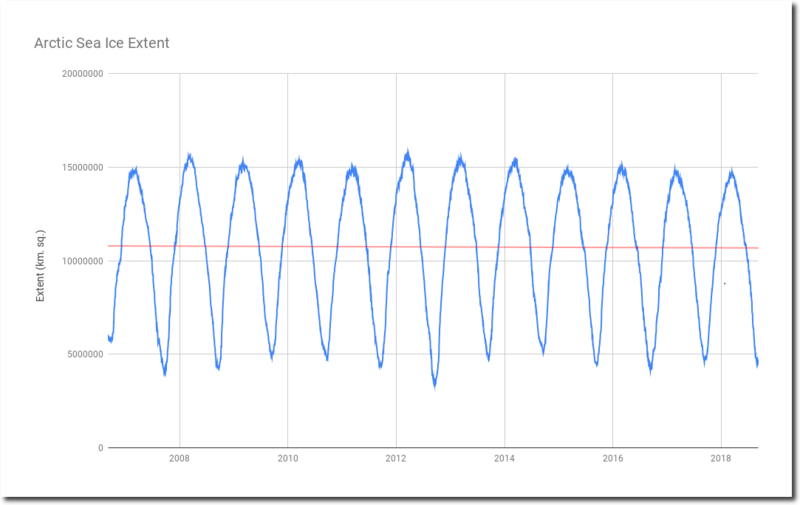 Where does the arctic sea ice graph come from – DMI ? Making up gibberish? You could have simply said “modeling”, same thing for these clowns. So while the extent has decreased slowly the volume has decreased more rapidly. Still no comments on the “settled science” and failed predictions? I guess the faithful refuse to be drawn into heresy. But it takes a really GULLIBLE and MORONIC person to actually cite them. 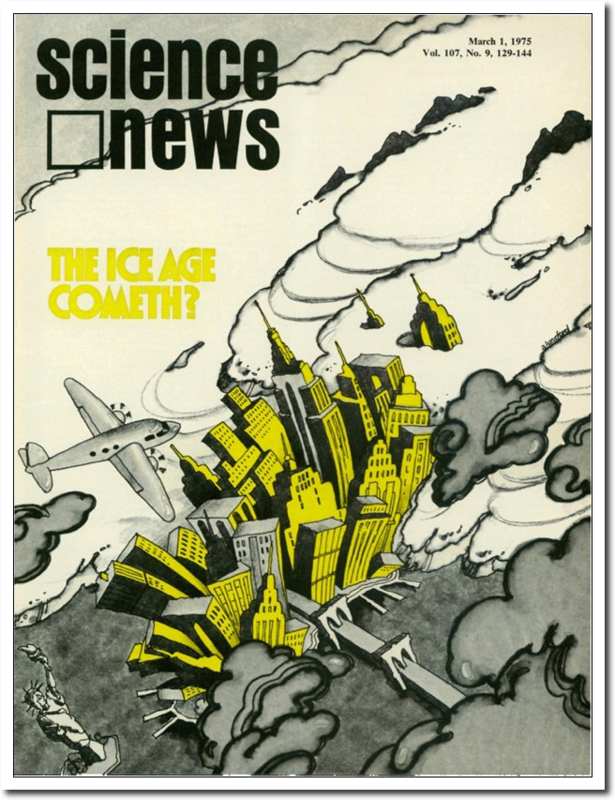 Yes, we all know that the late 1970s was a time of extreme sea ice up there with the LIA.. But the Arctic has recovered from those extreme events, a small way towards the Holocene normal. There is still one heck of a lot of sea-ice up there, Phlop. In general polynomials should be used with caution however quadratics such as this one are reasonable when there is indications of curvature.